I've been trying to find a way to make one-off electronic construction projects. After a few false starts this looks like one I can get good at. It's known as "Manhattan Pad" construction method. 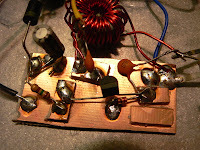 The circuit is built on top of copper board, unlike "ugly construction" components are joined by soldering them to little pads of copper board, cut up and super glued on to the base board. This makes it much easier to solder component by component for those of us who don't have three hands. Here is my first go, a simple VFO that covers 3-4Mhz. Once in a nice box with connectors on the outside you'd never know it wasn't a professional job. Having the components close to a ground plane helps with RF stability too. Apologies for my tiny steps, hopefully I will get on to more interesting projects soon.